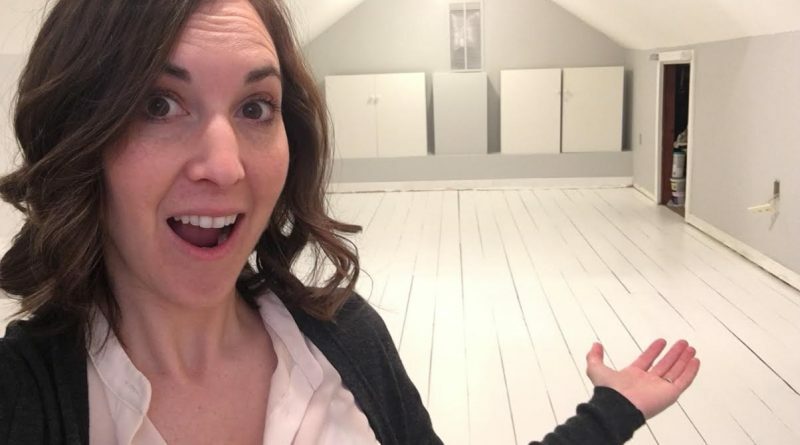 Aaron and Danielle Nadler are turning an attic that was once used as storage into a guest room. It’s amazing what a bit of spring cleaning can do. 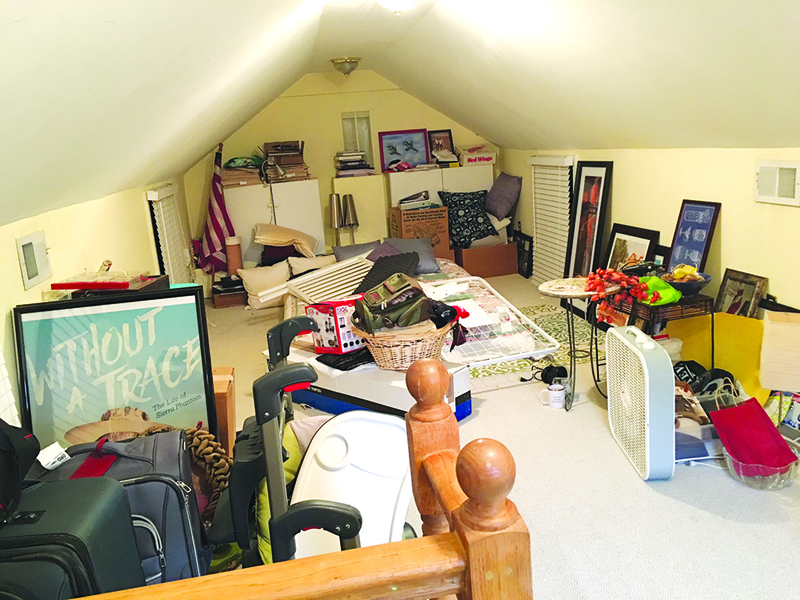 In our case, it prompted my husband and I to transform our attic from an out-of-the-way storage space for junk we’re not quite ready to part with to a furnished bedroom. And spend very little money doing it. It all started with a trip to the attic last month to return a box of Christmas and Hanukkah decorations. I hiked the steep stairs, navigating decomposing stink bug carcasses and dusty cobwebs, to make it to the third-floor landing. As I attempted to reach a Tupperware to return the stockings and the dreidels to their home, I felt like a kid playing hopscotch, leaping over forgotten throw pillows, abandoned soccer cleats, stacks of old newspapers, and kitchen supplies that didn’t make the cut to be stored anywhere near our kitchen. “This is insane,” I uttered under my breath. The next week, I declared to my husband that, since the crummy weather would keep us indoors anyway, we might as well clear out the attic. At that point, I didn’t have intensions to renovate the space. I just wanted to organize it a bit. Well, after three trips to donation bins, four very full trash cans dragged out to the curb, and a trip to the dump, I got inspired. Why not turn these 230 square feet into useful space? We’re often getting calls from friends who need a place to crash for a few nights. (We currently have a college student staying with us for a two-month stint.) Our family visits often from California and South Dakota. Not to mention, we’re certified foster parents awaiting our first long-term placement. So we started brainstorming ways to make the most of the space without spending a lot of money. Aaron first got to work ripping out the carpet—and the hundreds of staples that held it in place—that had likely been put down two or three decades ago. Underneath was vintage tongue and groove subfloor that, at first glance, didn’t look too bad. But with a closer look, we saw that a leak in the ceiling had left some water damage and that little care had been taken when the previous owners painted the ceiling so paint speckled most of the floor. We considered hiring a local company to refinish the floors, but we really wanted to keep this a low-cost project. So Aaron suggested painting the floors white, to offer a kind of beach house look, for a whopping $40 and a few hours of work. With an electric sander, I smoothed out the rough spots, and then with the help of a friend we applied two coats of white floor paint. We also painted the walls—from dandelion yellow to light gray—and added a fresh coat of paint to the ceilings and trim. Just those few changes has made the space feel open, clean and inviting. As you can see in the photos, Loudoun Now’s home improvement special section comes before we’re completely done with the project. Our next step is to put together a modern-looking bed, armchair and clothes rack we bought at IKEA. I’m a huge advocate for shopping locally owned stores (Belfort Furniture is our go-to), but the assemble-yourself furniture is all that can squeeze through the narrow staircase. We also want to install new ceiling lights and, if we can muster the energy, install built-in bookshelves on the back wall that double as storage for guests’ clothes. In all, we spent $120 on paint and supplies. It’s important to note, we got lucky in that the attic was partially finished, in the sense that it had heating and air conditioning, electricity, insulation and a window. 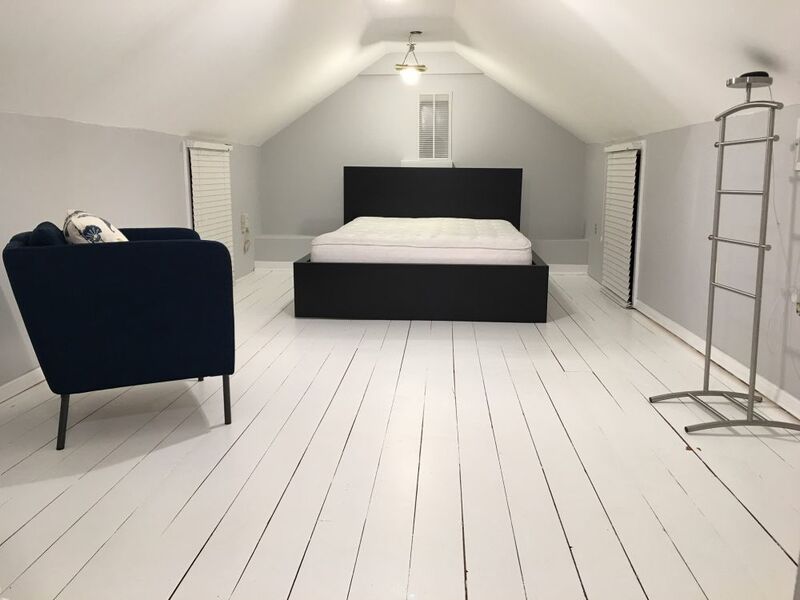 One day, we’d love to hire a crew to professionally finish the floors, build a Dutch dormer to add more ceiling space and natural lighting, and maybe even add a half bath. But until then, the space is exactly what we need. It will serve as a guest room for now. But it can easily be turned into a home office or a kids’ playroom, without spending much money. Picture beanbag chairs, video game consuls, and who knows, maybe an actual hopscotch court. Danielle Nadler is managing editor of Loudoun Now. The Nadlers’ attic before the big clean up and renovation.